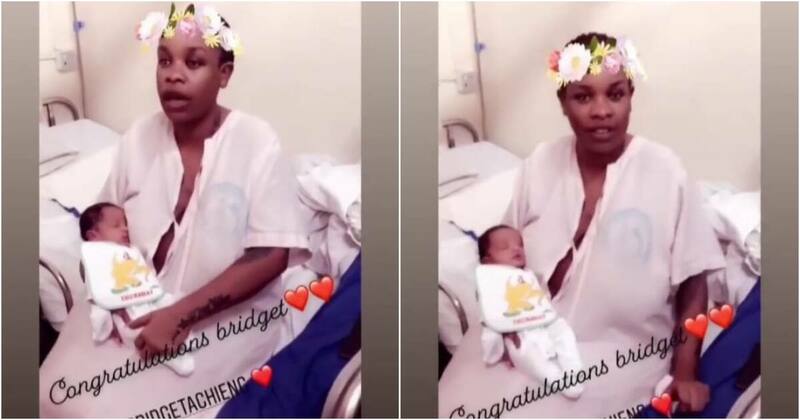 Unlike other personalities and socialites, Nairobi diaries heroine Bridget Achieng has indicated she will not be covering her adorable bundle of joy from the public. Barely three days following welcoming of her son, the new mom has unveiled him to the entire world. Heedless of the mom posing for a photo, the little angel calmly laid on her lap and none could help but fall in admiration with the lil one. Looking strong and firm just three days after the delivery of her baby through C-section, Bridget did not appear to mind that her posing for the photo would expose her son to the world. Okay, wait, I know the point that she even shared the photos with her followers indeed shows she doesn’t mind her baby’s image being on the interwebs, but wasn’t it too early? Be the judge. Nevertheless, Bridget welcoming her son arrives as a triumph for her considering the many dramas that lingered her during her pregnancy. Being her very first pregnancy, at some point, the socialite was so bewildered that she went on to reveal she had some serious baby blues three months before the due date.